Displaced persons camps. (Map: Ukrainians in Displacement Camps.) Concentrations of displaced persons in West Germany and Austria, which in 1945 were occupied by American, British, and French forces. In 1947 the camps held 1.6 million people (mainly from eastern and southeastern Europe), among them about 200,000 Ukrainians. The camps consisted of requisitioned military compounds, war-labor settlements, schools, etc. Until 1945 the camps were the responsibility of the Supreme Headquarters of the Allied Expeditionary Forces (SHAEF), which delegated this responsibility to DP Branch G-5, which was in charge of civilian affairs. Then the camps came under the authority of the various occupation armies, with the Combined Displaced Persons Executive (CDPX), which consisted of American, British, and French representatives as well as delegates from the International Refugee Organization in Geneva, co-ordinating the camps' activities. The occupation authorities placed the task of administering and supplying the DP camps on the shoulders of the United Nations relief organizations: the United Nations Relief and Rehabilitation Administration (UNRRA) from 1945 to August 1947, and then the International Refugee Organization (IRO). After most DP's had been resettled, the rest were absorbed by the German and Austrian economy, and the institutions of these countries became responsible for them (legal care became the responsibility of the UN High Commissioner for Refugees). The number of DP camps constantly diminished, going from 493 in 1946 to 223 in 1950. In 1956–8 the camps ceased to exist; their inhabitants were transferred to newly built settlements or to private housing. Ukrainian refugees in 1946 were interned in 125 camps and in 1949 in 110 camps (about 80 of these were predominantly or fully Ukrainian). The largest Ukrainian DP camps (2,000–5,000 people) were in the American zone, near Munich (Karlsfeld, Werner-Kaserne), Augsburg (Somme-Kaserne), Mittenwald (Jüager-Kaserne), Regensburg (Ganghofer-Siedlung), Aschaffenburg, Berchtesgaden (Orlyk), Bayreuth, Neu Ulm, Leipheim, and Dillingen. 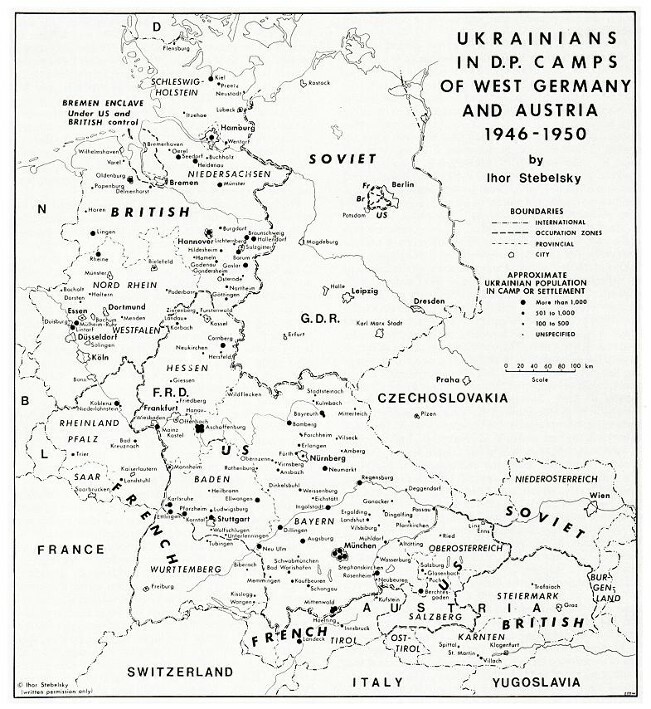 In the British zone there were large Ukrainian camps near Hannover and Heidenau, and in the French zone, near Stuttgart and Salzburg, Austria. As early as 1945 Ukrainian camps established their own local agencies of self-government, parallel to the UNRRA- or IRO-run administration of the camps. 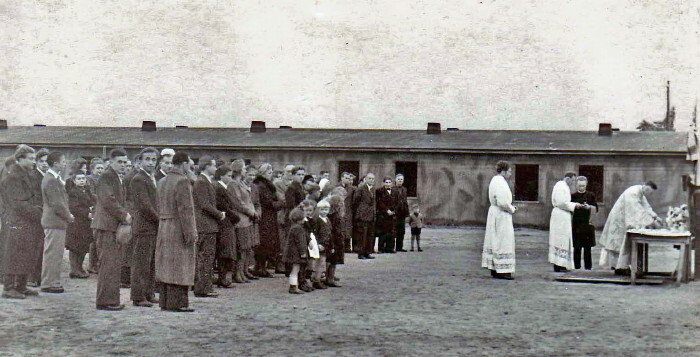 Beginning only in 1947 (de jure in 1948, with the directive of International Refugee Organization headquarters in Geneva issued on 15 June 1948) did the camp's own agencies participate in the running of the camps. In administrative matters they were subordinate to the IRO agencies and in civic matters to the Central Representation of the Ukrainian Emigration in Germany. An active civic, political, cultural, educational, religious, economic, literary, and artistic life developed in the camps during their brief existence. This is evident from the statistics: in 1948, for example, 102 elementary schools, 35 gymnasiums, 12 other secondary schools, and 43 trade schools functioned in the camps; as well, 232 periodicals and 818 books were published.